tamaham sirasaa vandey Rajaanam Kulasekharam.. The above sloka speaks about the Azhwar who was an Emperor seeking Lord Ranganatha’s darshan every breath ……..
Sri Kulasekhara Azhwar was the sixth among the illustrious Srivaishnava Azhwars. He appeared at a place in Kerala at Thiruvanjikalam and was a great devotee of LORD . He became more effulgent because of his total immersion in rendering service to the devotees Our Elders advise in a verse that …..
only when we have the feeling of being a servant in the presence of the devotees of the LORD then only we can have the realization of the LORD. As this is the only way one gets great strength that this quality only can confer us by giving us the objective of realizing the LORD amongs’t the devotees .If one was to weigh in a balance to find out whether Kulasekhara Azhwar had love to LORD or LORD’s devotees , one would find that his humility to the devotees of LORD was much much higher . It is said that it became a daily occurrence for the King to go along with his entourage to have darshan of Lord Ranganathar and that just before they proceeded on a pilgrimage they would see some great devotees coming opposite to them as guests of the King , and immediately , the King could not leave them because he felt he had the rare privilege to serve them as they were devotees of LORD that gave him immense happiness . This almost became a daily affair. Our elders advise that one must not keep aside the rendering of service to the devotees and instead render service to the LORD which is of no use due to the offense committed . It said during the actual worship of LORD when some devotees visit us they immediately handover the responsibility to other family member and rush to serve LORDS devotees . Kulasekhara Azhwar was such a great king. Normally Power takes a man to great heights thus forgetting his real self.However Azhwar showed utmost humility and regards in the presence of his devotees . He thus became Bhaktha Shiromani . The citizens used to comment that the King was a mad man as though he had all the wealth and power he rejected it and served LORD and HIS devotees unconditionally Azhwar composed a collection of wonderful pasurams named” Perumal Thirumozhi” and in one of the pasuram he laments that worldly people are suffering great poverty not knowing that right underneath the ground in the hut in which they are living , there lies a hidden treasure . These unfortunate persons , are all those worldly people who are not able to recognize the great LORD who is the In dweller in their heart and the Eternal witness . Not being able to recognize such a LORD who can redeem them they are attached to the temporary and inferior pleasures and thus bear great sufferings . He never thought he was an Emperor. Azhwar described four attributes of the LORD which are being sung by advanced devotees at Srirangam temple . Enamaai nilam keendathu ” Lord Varahas’s incarnation to save Goddess earth and assurance to Mahalakshmi through the Charama Sloka giving a boon to grant Moksha to all the devotees who surrender unconditionally . This varaha Charama sloka is recited as a part of the daily ritualistic worship in all the houses along with the Lord Krishna’s Bhagavad Gita Charama sloka . If at the final moments one is not able to recollect LORD they cannot attain Moksha .It is very difficult for a human to think of LORD in the dying state as he may not be in a position to use the power of speech and other senses due to his suffering from serious illness caused by accumulation of phlegm and other biliary diseases.The mind itself may be shriveled due to extreme pain .And the Mind is always occupied in anxieties of his kith and kin . Having noticed the difficult situation in which a dying person may be placed , the extremely compassionate Lord Varaha assures Mahalakshmi , he would definitely think of his supreme devotee and take them in his shelter . Recalling this great commitment the devotees were dancing in joy in the other premises . Varaha Charama sloka confirms that Lord thinks of his devotee during his final hours instead of the devotee thinking of LORD . In another part of the huge temple, another group of devotees were hymning the courage of LORD RAMA ” Mun Iraamanaai maaradarthathum “ Lord Rama overwhelmingly defeated the demon king Ravana by releasing a shower of arrows . Ravana was almost defeated as his bow fell down along with his chariot. Ravana was in great distress and agony .Lord could have killed the demon . Would anybody take that courage to release a dreaded enemy ?? That was LORD RAMACHANDRA …. Else where in the precincts of the big temple , some devotees were recalling the story of Lord Vamana. ” Mannalandhathum “..Though LORD was Emperor of Universe , he was willing to seek a favor from King Bali proving his opulence . Azhwar had musings of the Holy place Srirangam in every breath thinking of the above divine pastimes. All the above divine pastimes pertaining to the the LORD are extremely sweet . One such thought made Azhwar seek the association of those devotees who used to mentally recall all the divine pastimes and with great ecstasy dance in the temple precincts in various groups . In their ecstasy , they used to shed copious tears of joy and were immersed in happiness . Their tears of joy used to flow like a torrent stream . Srirangam has two branches of the river cauvery embracing it. In the process ,it looked as if this flow of tears , which had formed itself into stream was a third branch surrounding Srirangam . One devotee was in transcendental bliss recollecting his divine darshan at the holiest places .His soul rejoicing in ecstasy calling other devotees .. What a lucky soul I am …. The streets were flooded with wet mud due to this stream .The devotees were dancing in this wet mud chanting the HOLY NAME . Azhwar mentally recalled this sweet incident and expressed his desire that how fortunate he would be to apply on his forehead the wet mud as a holy mark in mark of respect to the great devotees singing LORD’s names ..
“O Lord Krsna, at this moment let the royal swan of my mind enter the tangled stems of the lotus of Your feet. Azhwar prays the Lord to keep him in the company of bhaktas, who relish the constant thought of the Lord’s lotus feet. 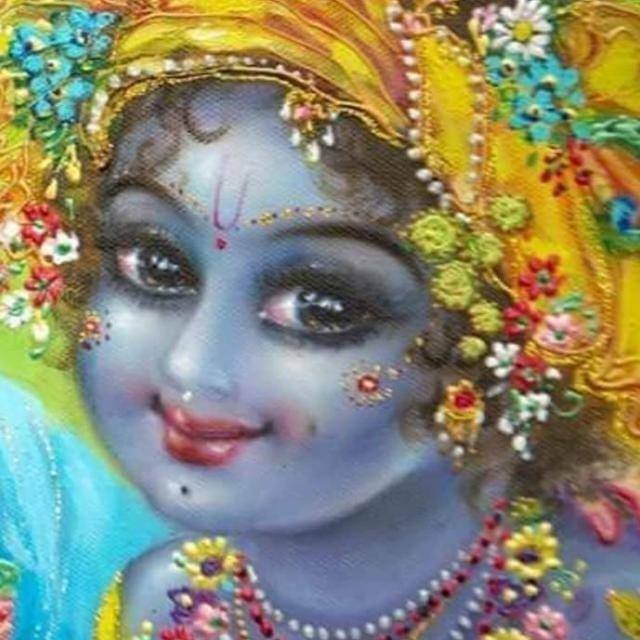 Such devotees are characterized by palms folded in supplication, heads bowed in devotion, hair ends of the body standing upright in joy, tones shaky with emotion, and eyes filled with tears………. all tell tale signs of their boundless bhakti brimming over. asmAkam SarasIruhAksha satatam sampadyatAm jeevitam”. The streets were flooded with wet mud due to this stream .The devotees were dancing in this wet mud chanting the HOLY NAME . 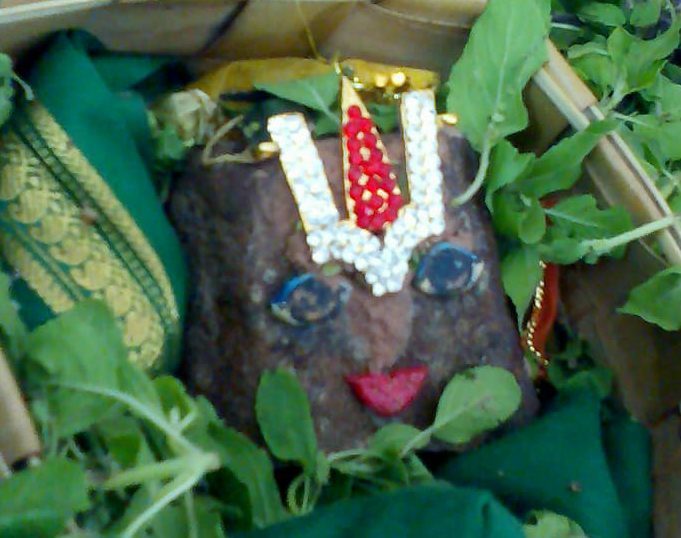 Azhwar mentally recalled this sweet incident and expressed his desire that how fortunate he would be to apply on his forehead the wet mud as a holy mark in mark of respect to the great devotees singing LORD’s names ..
” Sukadara maparam Na jadu jaanae Hari charana Smaranam mrudhena dulyam…” Enough…. We can breathe easily.- Adiyen Ramanuja Dasyai. Jai Sriman Narayana!